That “bomb cyclone” that smacked into the middle of our country has a name that evokes goofy fun carnival rides, but is, quite defiantly, no joke. 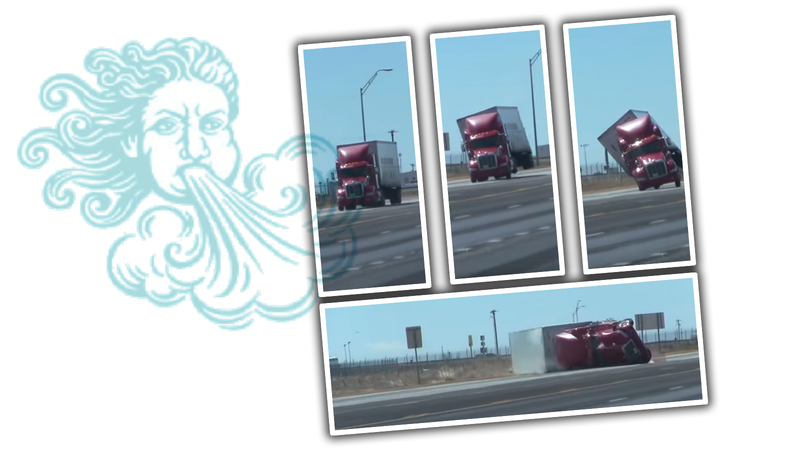 A good example of how un-jocular this thing is happened yesterday in Amarillo, Texas, when 75 MPH winds shoved this semi truck over like it was a big toy. Granted, a truck does present a pretty sail-like and wind-grabby side profile, but remember that those things routinely weigh upwards of 40,000 pounds. That’s a lot of mass for air to shove over like that. Luckily, nobody was hurt here, though if that truck was filled with eggs and Hummel figurines, I don’t think the outcome would be good. Maybe it was full of marshmallows and pillows.